The Sox are one of only five teams in Major League Baseball to make the playoffs the last two seasons, and in the American League, only the Cleveland Indians have more victories in that time. Yet there was no disappointment from the fan base after last season when the Red Sox fired manager John Farrell. It was clearly time for a change, and the team needed new leadership. The Red Sox did this through the hiring of Alex Cora as the new manager and replacing almost the entire coaching staff. Alex Cora and his staff had to implement a new philosophy right away. He had the difficult task of trying to figure out how to improve a baseball team that won back-to-back division titles, avoid losing three consecutive first round playoff series, and fix the team’s locker room culture. The signing J.D. Martinez was needed to improve the lack of power the Red Sox had a year ago. Last season, they ranked 27 out of 30 in home runs without recording a grand slam. To go along with this, pitchers David Price and Carson Smith, who were injured almost all of last season, returned healthy this season. The Red Sox began the 2018 season with the highest payroll in the MLB at $223 million. That is roughly $20 million more than the next closest team, the San Francisco Giants. Although they have the highest payroll, there are still holes in the roster. With the loss of Addison Reed, it is not known who will get the ball to Craig Kimbrel on a consistent basis, but the Sox are showing faith in Matt Barnes and Joe Kelly, among others, to get the ball to their star closer. Injuries to Drew Pomeranz, Eduardo Rodriguez, and Steven Wright have forced them to start out the year on the disabled list, and with their history of injuries, it will be difficult for the Sox to rely on them to consistently fill out the back end of the starting rotation. The team has been unexpectedly relying on Brian Johnson and Hector Velazquez to fill out the rotation, but the question is how long will their contributions go on. These pitching concerns could be less important if new the hitting coach, Tim Hyers, continues to generate production from Mookie Betts, Xander Bogaerts, Hanley Ramirez, and Jackie Bradley Jr. All four were offensive underachievers to varying degrees last season. The Sox also will gain from a full season with young third baseman, Rafael Devers, who is a gifted hitter with power. The best part of this season, for the fans at least, will be the return of the rivalry between the Red Sox and Yankees. 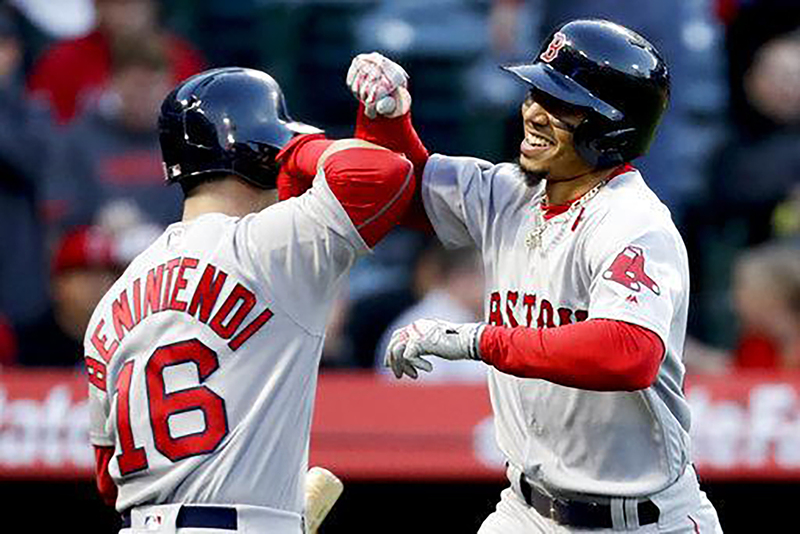 As we all know, the rivalry returned with the brawl involving Joe Kelly and Tyler Austin, but the five remaining series the teams play will be mandatory viewing given all the star players and with the American League East at stake. It will not be easy for Cora to get this team to the World Series. The Sox will have to get past the 2017 World Champion Houston Astros, the Cleveland Indians, and the rival New York Yankees. I project the Sox to go 94-68 during the regular season and eventually earn the first wild card spot in the American League. Even though the Yankees are struggling right now, they will likely come around to win the division due to stars like Aaron Judge, Giancarlo Stanton, the strength of their team—that is the bullpen—and the assets they have to go acquire a top-notch starter at the trade deadline. However, that will not be enough to take down the Houston Astros who brought back most of their lineup and added former Pittsburgh Pirates ace Gerrit Cole. The talent is certainly there to win around 95 games and get back to the World Series for the first time since 2013. The Sox are filled with talent and their window is still open while they have players with affordable contracts like Chris Sale, Mookie Betts, and Xander Bogaerts, and whileCora is here to push them through.